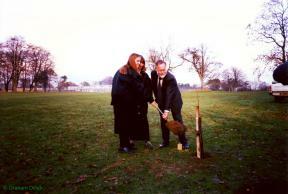 The Millennium Tree Line project made what is thought to be its third UK planting here in November 1996. Of the three trees planted, none survive. Their proximity to the touchline of a football pitch would undoubtedly have presented a health and safety hazard. How long they survived is not known, but they were long since gone by 2006.